January 29, 2014 0 comments on "7 Steps to Efficient Heating"
Your heating bill can easily be altered by the smallest changes. Tiny nuances that come with everyday living can add up and drastically increase your monthly payments. Being conscientious of these developments will keep your house warmer and your wallet happier. Additionally, these tips will boost your home’s economic responsibility and reduce your carbon footprint. Be mindful of how you affect the planet by being mindful of how you affect your house. 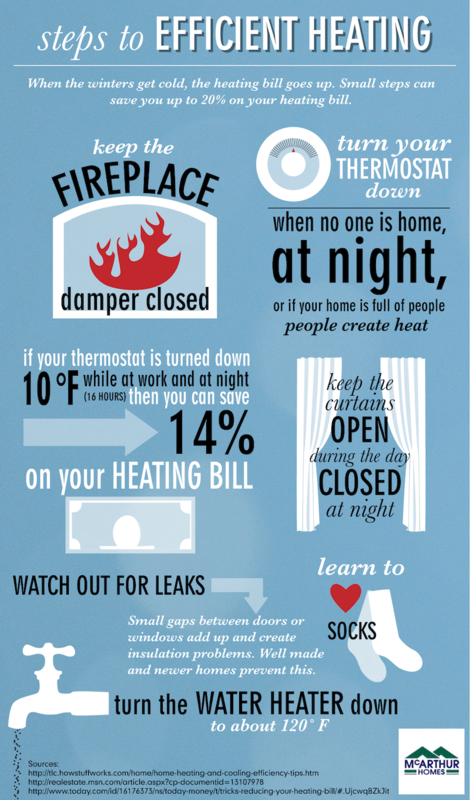 Follow the steps in this infographic provided by mcarthurhomes.com in order to decrease your monthly heating bill.